I have heaps more tutorials here! I'm pretty proud of myself right now. I just spent aaaages making two tutorials and I'm happy with how they turned out. Lets just forget the fact that my bum's sore from sitting down too long and all I've eaten today is some pikelets and it's 4.30pm. OH WAIT no, I had a sandwich. It's okay then. I'm only posting one tutorial today, but I'll schedule the next one for tomorrow. 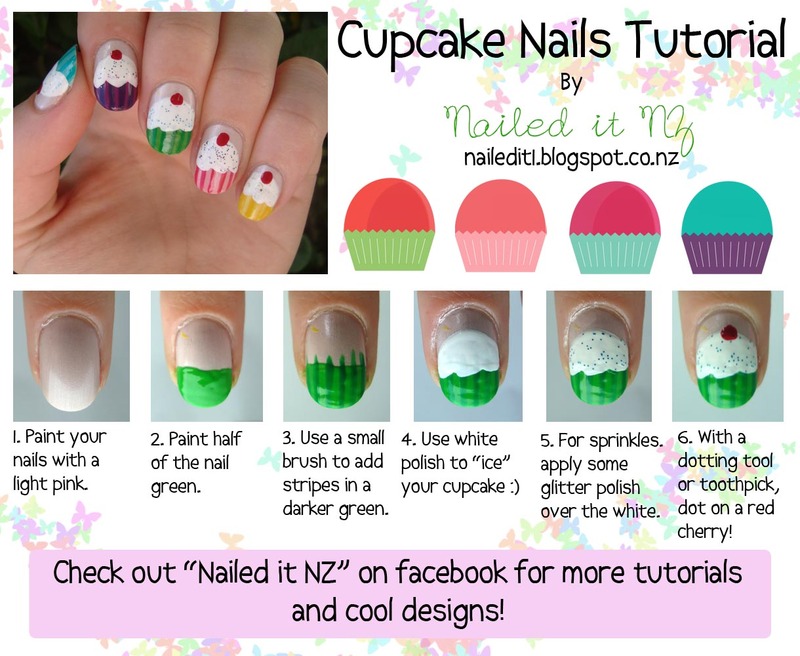 So, introducing my cupcake nail art tutorial! Isn't it cute? I have a lot of teenagers that like my facebook page, so I think they'll like this. And look at all the pretty butterflies!! By the way, if you're doing Take Two in December and the linky thing disappeared, don't freak out. Well, maybe you can a little because it's not fixed yet but we're trying to make it work. I'll probably just end up paying for the service, unless anyone has a better idea?? I'm just gonna keep rambling on inbetween these photos. Normally I'd explain how I did it, but the tutorial kind of did that so I'm out of a job. I do like my cupcakes though, they're adorable :). So I found out a couple of hours ago that another awful facebook page is stealing nail artists photos and blurring out their watermarks - including mine. This is why I now have two watermarks on my photos... I am so ANGRY! WHY do you feel the need to remove my watermark? I'm going to do a post about this soon so I won't go on about it too much, but thought I'd mention it. Not cool. I've run out of things to say now. I liked this one and the purple and pink one best. The green and yellow cupcakes were okay, but not amazing. Here's a more average photo of both of my hands, just to prove that I did it on my right hand as well! My friend Katie came over yesterday and I painted her nails with a monarch butterfly design. Cute, huh? I'm loving them. That colour is Green with Envy by Rimmel, btw. They have dumb brushes but it was worth using it for the gorgeous colour. Done! Time to upload these photos to the 40 million social networking sites I'm part of before some stupid teenager does! No offence teenagers, love you long time xoxo. Oooh these are so cute!! I love your nail art so much! Aw thanks Jenn! I know right? Wouldn't you know it was just inherently wrong to steal someone else's work in that way? Ridiculous. Oh cool, I hope you do! Thanks! Thanks! The butterflies aren't as hard as they look, cutepolish on youtube has a good tutorial! I'm loving tutorial Nivember even though it must be crazy for your bum - lol!! These turned out so cute! It is! I think it's permanently sore now! Haha thanks! I am impressed with this manicure! This was the first time I've done them but I don't think I will either! I absolutely love that you do our tutorials as an image. It makes it so easy to save it so i can find it in my camera roll for later inspiration and not forced to go blog archive searching to find it. Thank you! You're welcome! It's easier for me in the long run too :) Glad you like them!